The speaker is the chairperson in the House of Commons and Lord Chancellor is the chairperson in the House of Lords. 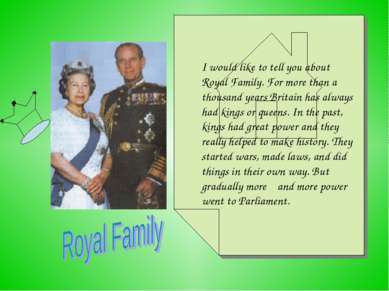 The residence of the Queen Elizabeth II is Buckingham Palace. The residence of the Prime Minister is Downing Street, 10 in London. Tony Blair is the Prime Minister today. The popular name of the UK is Union Jack (according to the flag). Union - because it consists of several flags: English, Scottish, Welsh and Irish. Jack is an old word for sailor. The United Kingdom of Great Britain and Northern Ireland is a parliamentary monarchy. Formally the Queen is the head of the state but in reality the Prime minister has more power. Usually the Queen appoints the Prim minister that is the head of the state. 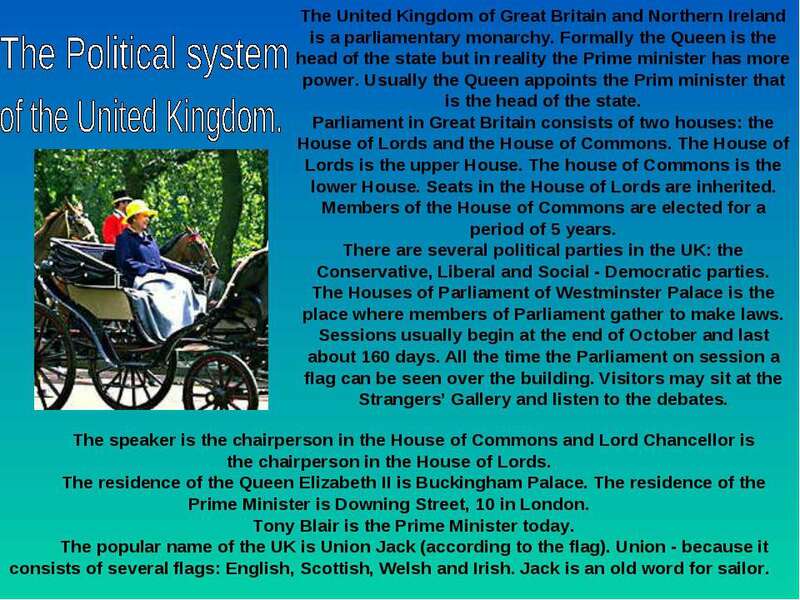 Parliament in Great Britain consists of two houses: the House of Lords and the House of Commons. The House of Lords is the upper House. The house of Commons is the lower House. Seats in the House of Lords are inherited. Members of the House of Commons are elected for a period of 5 years. There are several political parties in the UK: the Conservative, Liberal and Social - Democratic parties. The Houses of Parliament of Westminster Palace is the place where members of Parliament gather to make laws. Sessions usually begin at the end of October and last about 160 days. All the time the Parliament on session a flag can be seen over the building. Visitors may sit at the Strangers’ Gallery and listen to the debates. 1. 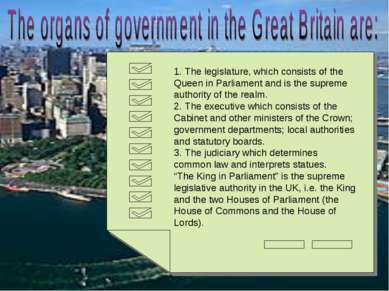 The legislature, which consists of the Queen in Parliament and is the supreme authority of the realm. 2. 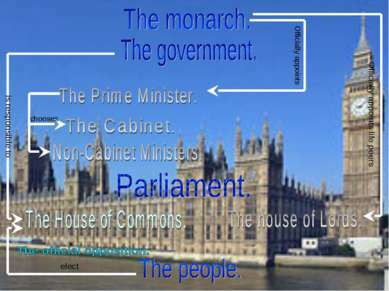 The executive which consists of the Cabinet and other ministers of the Crown; government departments; local authorities and statutory boards. 3. The judiciary which determines common law and interprets statues. 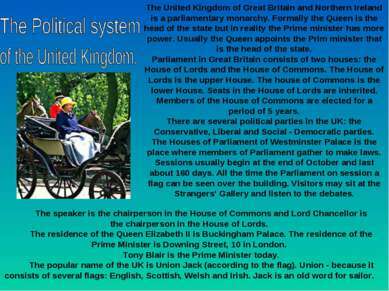 “The King in Parliament” is the supreme legislative authority in the UK, i.e. the King and the two Houses of Parliament (the House of Commons and the House of Lords). In principle, the “Crown in Parliament” is supreme. 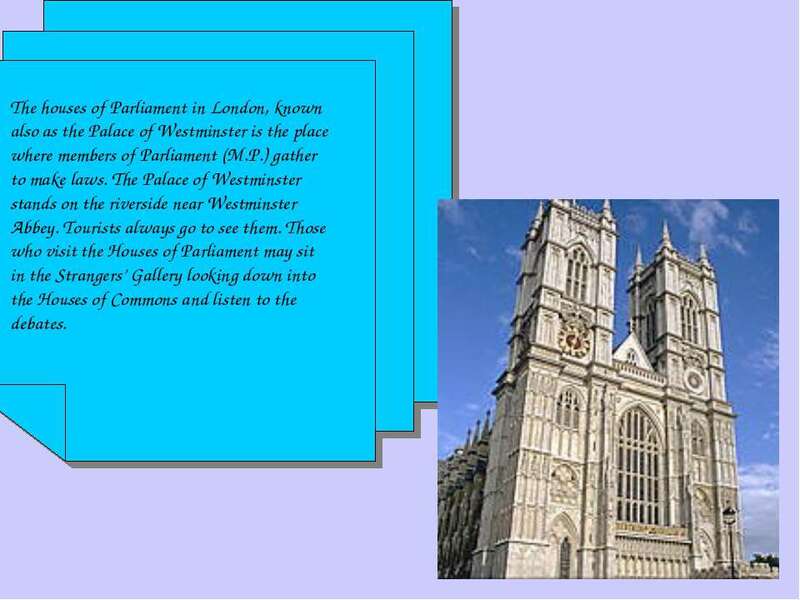 This means that legislation passed by Parliament, which consists of the House of Commons (elected directly by the people) and the House of Lords (made up of hereditary peers and appointive members—archbishops, senior bishops, law lords, and life peers) becomes law upon royal assent. 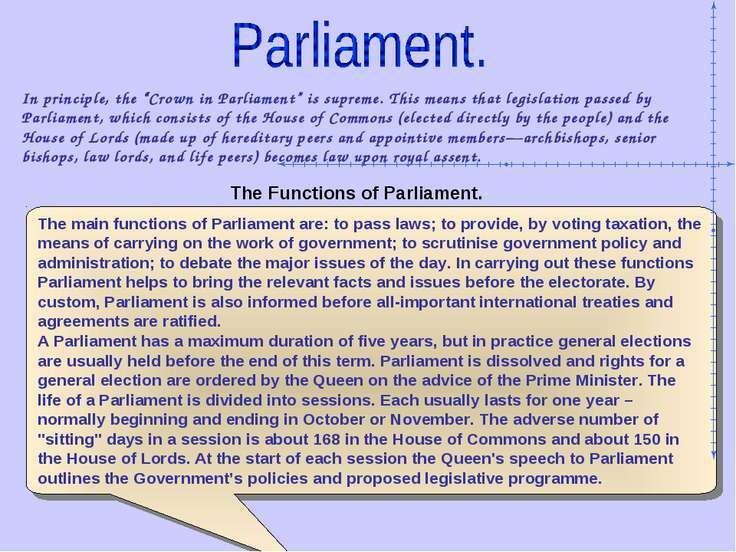 The main functions of Parliament are: to pass laws; to provide, by voting taxation, the means of carrying on the work of government; to scrutinise government policy and administration; to debate the major issues of the day. In carrying out these functions Parliament helps to bring the relevant facts and issues before the electorate. By custom, Parliament is also informed before all-important international treaties and agreements are ratified. A Parliament has a maximum duration of five years, but in practice general elections are usually held before the end of this term. Parliament is dissolved and rights for a general election are ordered by the Queen on the advice of the Prime Minister. The life of a Parliament is divided into sessions. Each usually lasts for one year – normally beginning and ending in October or November. The adverse number of "sitting" days in a session is about 168 in the House of Commons and about 150 in the House of Lords. At the start of each session the Queen's speech to Parliament outlines the Government’s policies and proposed legislative programme. The Functions of Parliament. The houses of Parliament in London, known also as the Palace of Westminster is the place where members of Parliament (M.P.) gather to make laws. The Palace of Westminster stands on the riverside near Westminster Abbey. Tourists always go to see them. Those who visit the Houses of Parliament may sit in the Strangers’ Gallery looking down into the Houses of Commons and listen to the debates. 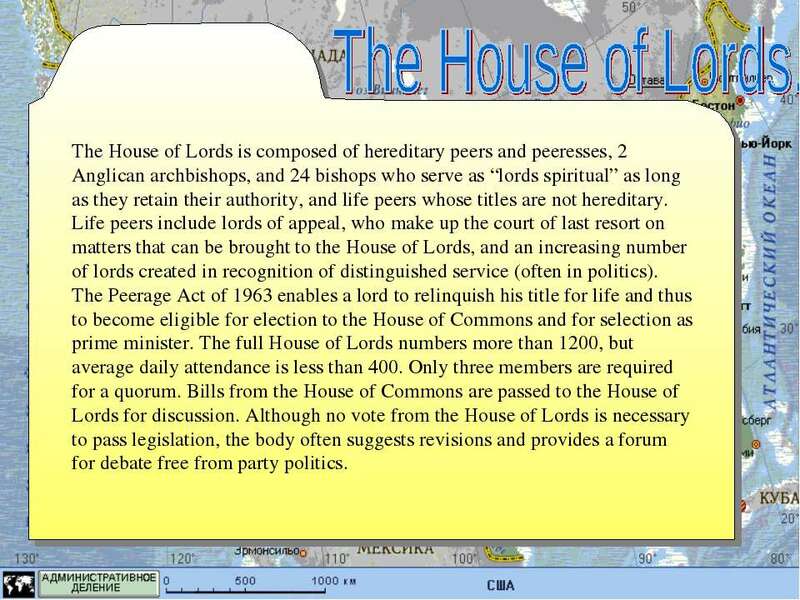 The House of Lords is composed of hereditary peers and peeresses, 2 Anglican archbishops, and 24 bishops who serve as “lords spiritual” as long as they retain their authority, and life peers whose titles are not hereditary. Life peers include lords of appeal, who make up the court of last resort on matters that can be brought to the House of Lords, and an increasing number of lords created in recognition of distinguished service (often in politics). The Peerage Act of 1963 enables a lord to relinquish his title for life and thus to become eligible for election to the House of Commons and for selection as prime minister. The full House of Lords numbers more than 1200, but average daily attendance is less than 400. Only three members are required for a quorum. 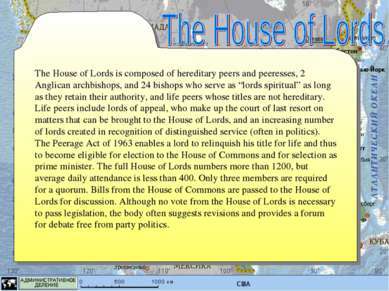 Bills from the House of Commons are passed to the House of Lords for discussion. Although no vote from the House of Lords is necessary to pass legislation, the body often suggests revisions and provides a forum for debate free from party politics. Members of the House of Commons are elected from geographical constituencies. The voting age for British subjects was lowered to 18 in 1969. Those not eligible for election to the Commons include members of the House of Lords, selected clergy, government contractors, sheriffs, and certain designated election officials. 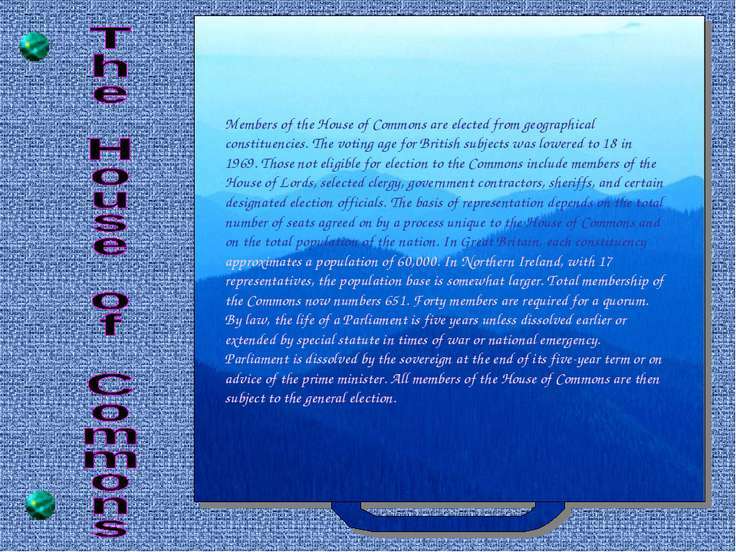 The basis of representation depends on the total number of seats agreed on by a process unique to the House of Commons and on the total population of the nation. In Great Britain, each constituency approximates a population of 60,000. In Northern Ireland, with 17 representatives, the population base is somewhat larger. Total membership of the Commons now numbers 651. Forty members are required for a quorum. 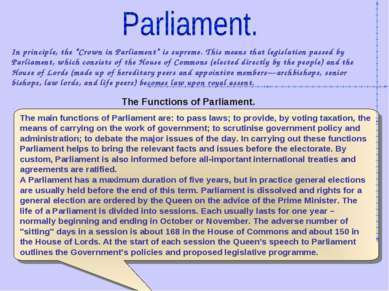 By law, the life of a Parliament is five years unless dissolved earlier or extended by special statute in times of war or national emergency. Parliament is dissolved by the sovereign at the end of its five-year term or on advice of the prime minister. 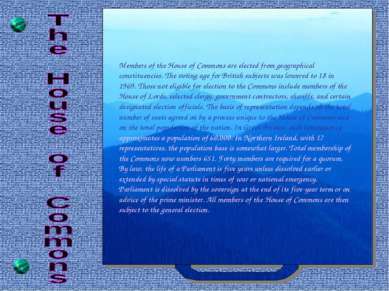 All members of the House of Commons are then subject to the general election. Although, in theory, any member of Parliament may propose a bill, most legislation is initiated by the cabinet minister responsible for the department concerned. Acts passed by Parliament tend to be worded in general terms; they are implemented, with specification of detailed provisions, by Orders in Council, prepared by the minister responsible and promulgated by proclamation of the Crown. The cabinet, under the doctrine of collective responsibility, acts as a unit. The defeat of important legislation or a vote of no confidence usually brings about the resignation of the entire cabinet and a general election. The prime minister may drop individual cabinet members entirely or reassign them as preferred.  This power helps to maintain the prime minister's leadership and is exercised in most governments periodically. Ministers may resign their posts without leaving the Parliament. 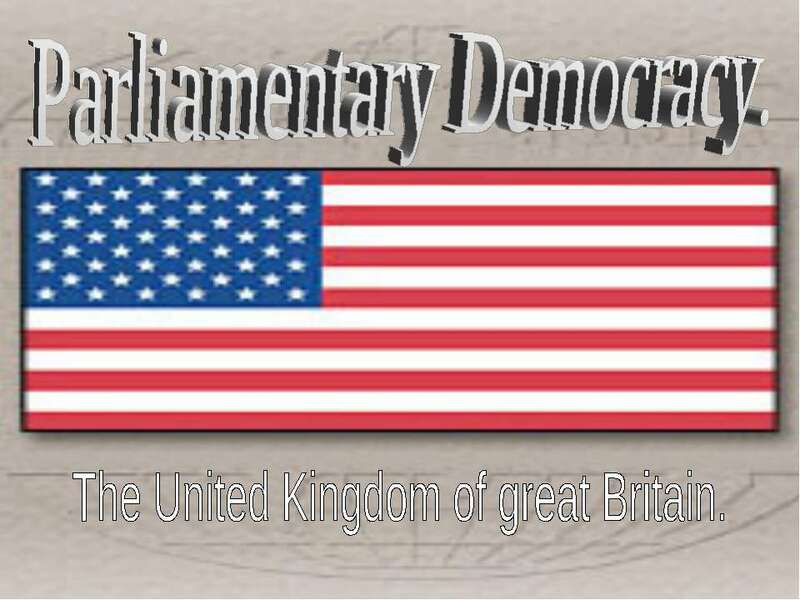 Because of the dominant role of the cabinet, the House of Commons did not have specialized committees, in the style of the Congress of the United States, until recently. Beginning in 1979, however, a pattern of committees specialized in function has emerged. This new lineup of select committees provides detailed debate and consideration rather than only general review and approval. 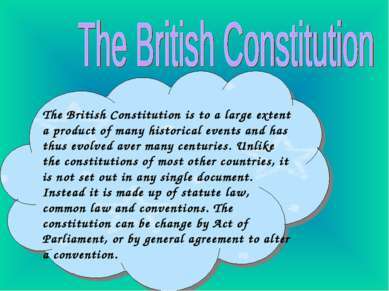 The British Constitution is to a large extent a product of many historical events and has thus evolved aver many centuries. Unlike the constitutions of most other countries, it is not set out in any single document. Instead it is made up of statute law, common law and conventions. 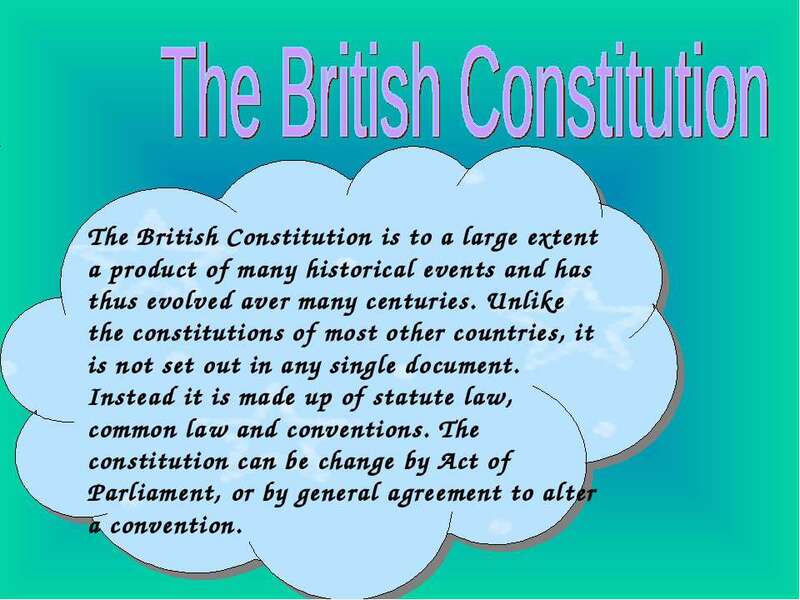 The constitution can be change by Act of Parliament, or by general agreement to alter a convention. 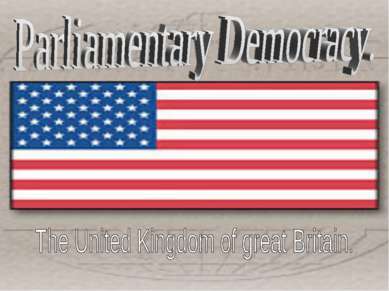 The fast is that the government of Great Britain is unitary in structure. Thus, the powers of local government derive from Parliamentary acts, and responsibility for the overall administration of the country rests with specified cabinet ministries. 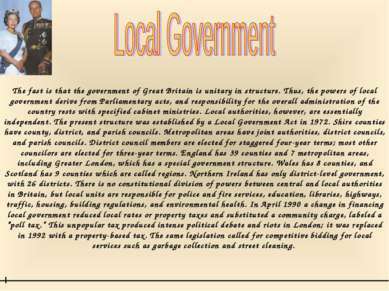 Local authorities, however, are essentially independent. The present structure was established by a Local Government Act in 1972. Shire counties have county, district, and parish councils. Metropolitan areas have joint authorities, district councils, and parish councils. District council members are elected for staggered four-year terms; most other councilors are elected for three-year terms. England has 39 counties and 7 metropolitan areas, including Greater London, which has a special government structure. Wales has 8 counties, and Scotland has 9 counties which are called regions. Northern Ireland has only district-level government, with 26 districts. 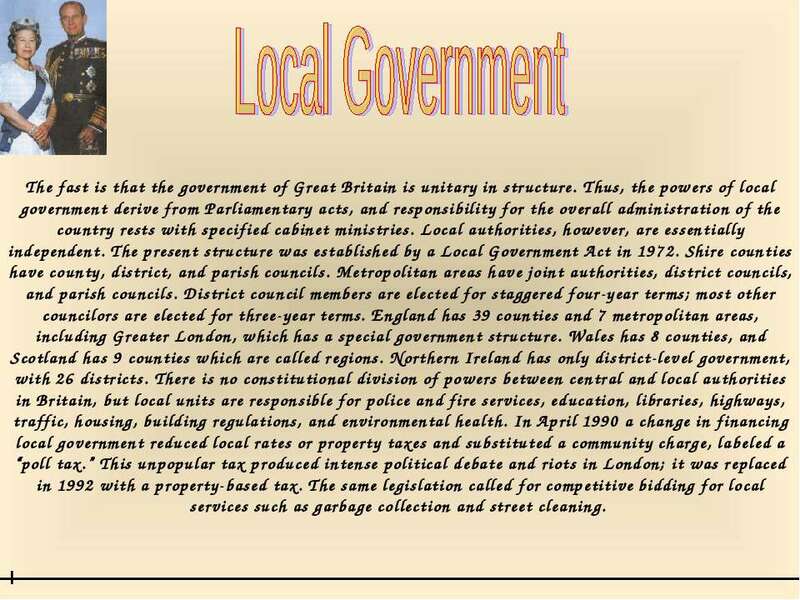 There is no constitutional division of powers between central and local authorities in Britain, but local units are responsible for police and fire services, education, libraries, highways, traffic, housing, building regulations, and environmental health. In April 1990 a change in financing local government reduced local rates or property taxes and substituted a community charge, labeled a “poll tax.” This unpopular tax produced intense political debate and riots in London; it was replaced in 1992 with a property-based tax. The same legislation called for competitive bidding for local services such as garbage collection and street cleaning. 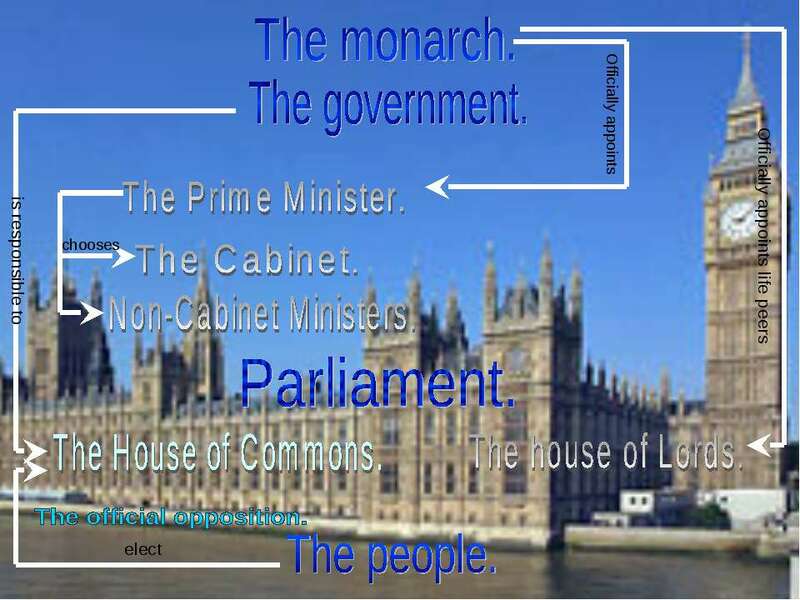 In form, the United Kingdom is a constitutional monarchy with legislative power vested in an elected government, and executive power vested in a Cabinet led by the Prime Minister whose power, though carried out in the monarch's name, is answerable to Parliament and through it the electorate. A constitutional monarchy is a form of government established under a constitutional system, which acknowledges a hereditary or elected monarch as head of state. 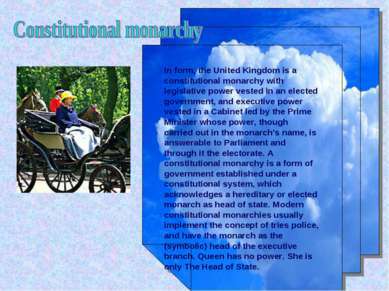 Modern constitutional monarchies usually implement the concept of tries police, and have the monarch as the (symbolic) head of the executive branch. Queen has no power. She is only The Head of State. The Prime Minister is the chief officer of Her Majesty's Government in the United Kingdom (before 1801, the Kingdom of Great Britain). The full title of the current Prime Minister, Tony Blair, is Prime Minister, First Lord of the Treasury and Minister for the Civil Service of the United Kingdom of Great Britain and Northern Ireland. In some sense, the office may still be thought of as only a de facto one — in theory, perhaps, the only real function of the prime minister as such is to "form a government" (that is, appoint the cabinet). All the actual business of running the country and spending the budget is carried out by more explicitly defined cabinet ministers, empowered by various acts of parliament. Certainly the prime minister's salary and public accommodation (see below) are technically provided to him as First Lord of the Treasury, an office to which he has appointed himself. 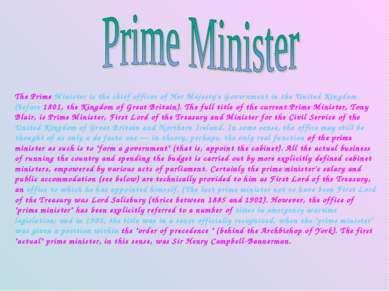 (The last prime minister not to have been First Lord of the Treasury was Lord Salisbury (thrice between 1885 and 1902). 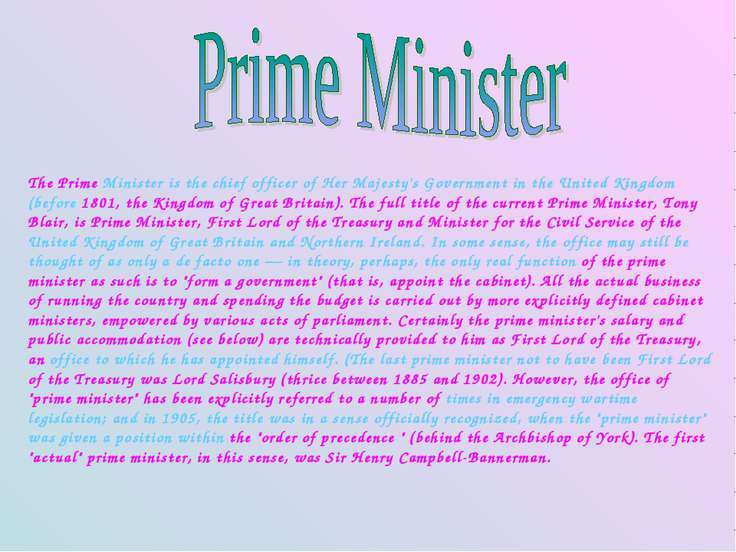 However, the office of "prime minister" has been explicitly referred to a number of times in emergency wartime legislation; and in 1905, the title was in a sense officially recognized, when the "prime minister" was given a position within the "order of precedence " (behind the Archbishop of York). The first "actual" prime minister, in this sense, was Sir Henry Campbell-Bannerman. 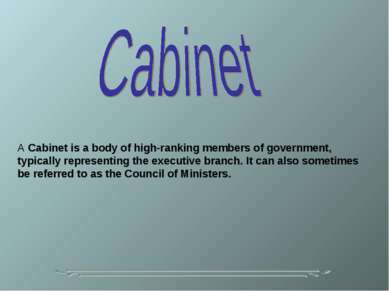 A Cabinet is a body of high-ranking members of government, typically representing the executive branch. It can also sometimes be referred to as the Council of Ministers. 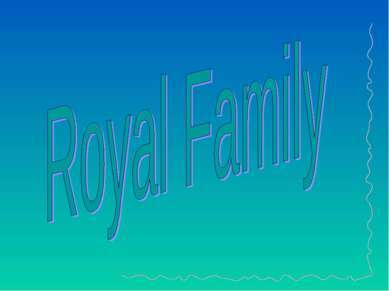 The Royal Family I would like to tell you about Royal Family. For more than a thousand years Britain has always had kings or queens. In the past, kings had great power and they really helped to make history. They started wars, made laws, and did things in their own way. But gradually more and more power went to Parliament. 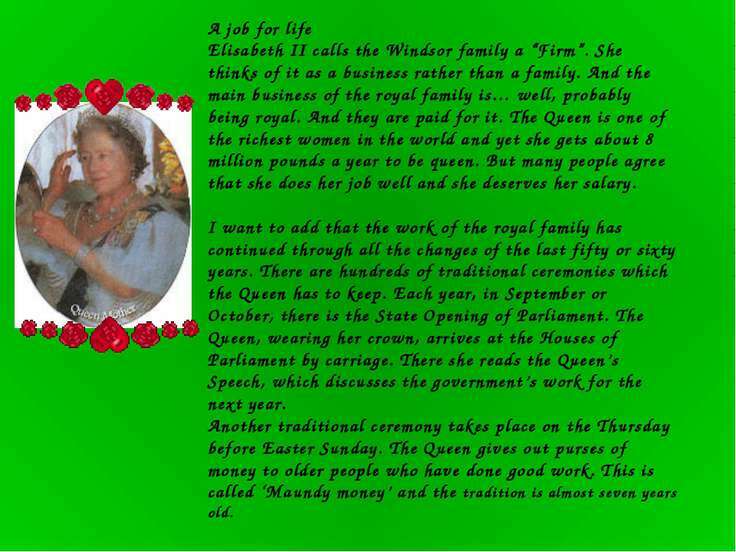 A job for life Elisabeth II calls the Windsor family a “Firm”. She thinks of it as a business rather than a family. And the main business of the royal family is… well, probably being royal. And they are paid for it. The Queen is one of the richest women in the world and yet she gets about 8 million pounds a year to be queen. But many people agree that she does her job well and she deserves her salary. 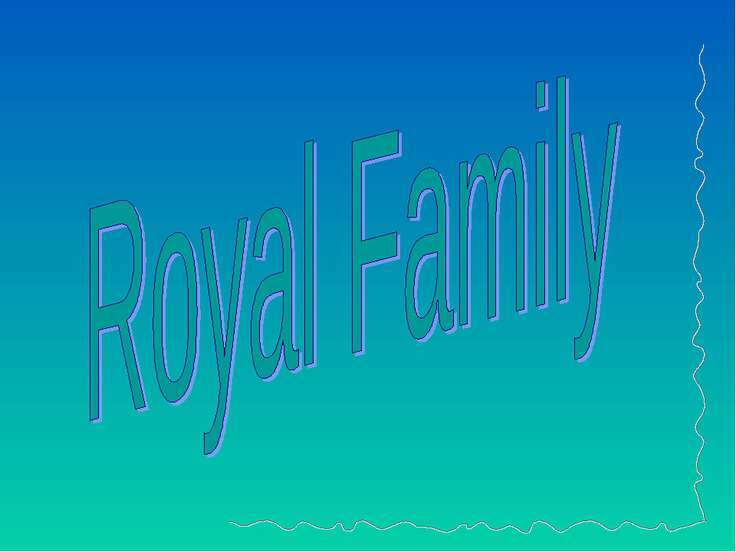 I want to add that the work of the royal family has continued through all the changes of the last fifty or sixty years. There are hundreds of traditional ceremonies which the Queen has to keep. Each year, in September or October, there is the State Opening of Parliament. The Queen, wearing her crown, arrives at the Houses of Parliament by carriage. There she reads the Queen’s Speech, which discusses the government’s work for the next year. Another traditional ceremony takes place on the Thursday before Easter Sunday. The Queen gives out purses of money to older people who have done good work. This is called ‘Maundy money’ and the tradition is almost seven years old.